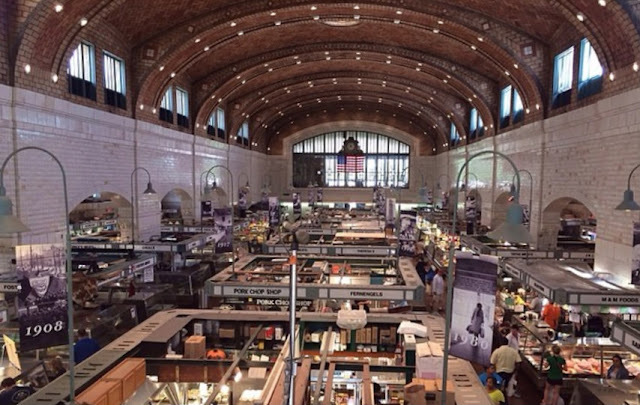 Last Sunday marked the first Sunday that Cleveland's storied West Side Market was open for business. Historically closed on Tuesdays, Thursdays, & Sundays, the market is now officially open for business on both days of the weekend, with limited Sunday hours that begin at noon. Of course, it snowed on Sunday. Happy April from Cleveland! Stopping by the West Side Market is one of my absolute favorite Cleveland activities, & if you're in town for a visit, you've got to make a trip there. If you live nearby & you've never been to WSM, well, what are you waiting for?! 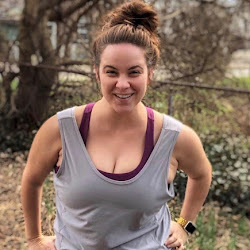 Here are a few of my market must-haves, the items I keep coming back to. If you're a WSM regular, tell me: What else do I need to try? Lake Erie Creamery makes these incredible chevre balls in rosemary olive oil with colored peppercorns. Sold at WSM's The Cheese Shop, they're a little expensive ($8 for the small jar or $14 for the large), but they're worth it. And I can't stop eating them. When I'm done with the cheese, I use the herbed oil over pasta and grilled shrimp for a light, indulgent dinner. Grandma Campbell's Cupcakes is a division of Campbell's Sweets, one of Cleveland's favorite sweet shops (more on them in a bit!) While I imagine all their cupcakes are delicious, I wouldn't know because I always come back to the same one. Their lemon cupcake is perfectly moist & dense, not too heavy or crumbly. If you show up early, you can get them fresh out of the oven & still warm! I've never had beef pinwheels. I don't know what beef pinwheels are. But I do like this sign kind of a lot. It's one of many that give me a laugh at WSM, like the huge, neon sign above the cake place that just says "CAKE," in case you didn't quite understand what they sell. WSM has a large almost-open-air section that's covered in glass, sort of like a greenhouse. The whole thing reminds me of the shuk in Israel, where you can barter & haggle & stock up on fresh fruits & veggies. I love the fresh stuff, of course, but I also have a weakness for these dried strawberries, sold by a few different vendors. They taste like candy! Every time I visit West Side Market, I buy as much Ohio City Pasta as I can carry (& homemade pasta is pretty heavy!) Their linguini & fettuccine comes in all kinds of flavors, & though I usually stick to the spinach & the garlic, I've been dying to try the saffron. Um, what goes with saffron pasta? I'll let you know. But seriously, this stuff is so amazing that boxed spaghetti & I are never, ever, ever getting back together. When I'm not going myself on dried strawberries, my favorite fruit from West Side Market is dragon plums (which the Internet tells me are just pluots, which is kind of disappointing). They are so sweet & delicious. I've actually never had a regular plum, but I am totally sold on this variety. I've yet to buy a non-cupcake dessert from West Side Market, but I've got my eye on these lady locks, any cannoli I can find, & every macaron in existence. Have I mentioned that this place is chock-full of homemade sweets? If you're into pourover coffee, you're into Rooted in CLE, where Mike once got a cup of coffee that took ages, but only because it was given so much individual attention. Like, these folks know their coffee, & they put love into it. Bonus? The barista had lots of good dinner recs for us. The West Side Market also has its own cafe, aptly named the West Side Cafe. It's attached to the market, & while their menu is pretty standard, it's also pretty tasty. It's also got a few very Clevelandy dishes thrown in for good measure, like the Pierogi Melt: a sandwich made of pierogis, saurkraut, & muenster cheese. Cleveland, you're out-Clevelanding yourself. Everybody's tried the combo of cheese corn with caramel corn, right? The aforementioned Campbell's Sweets one-ups that mixture by cheese-coating their caramel corn. 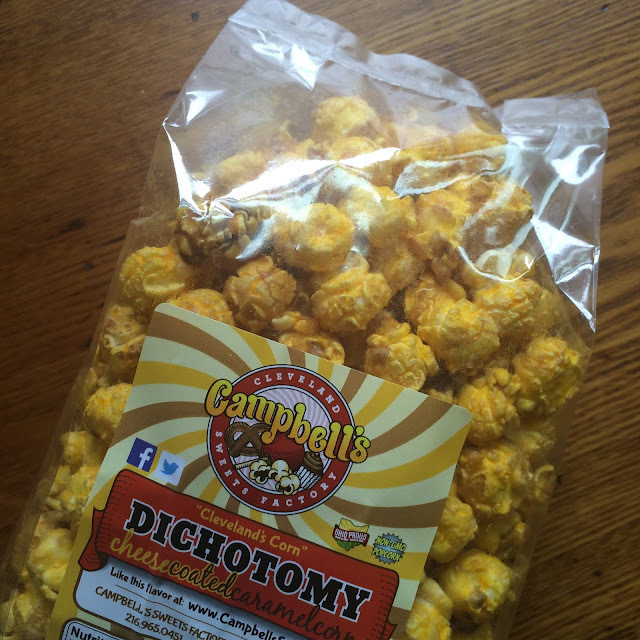 There's not much more to say about their famous Dichotomy Popcorn. It's incredible. And you can't order it online. Sorry. I haven't bought any yet, but you can stock up on all your bacon needs at the West Side Market. It's like the meat vendors compete for the best-sounding bacon rubs: curried bacon, cinnamon chipotle bacon, garlic bacon, Jamaican jerk bacon, &, while we're tallking about gettin' real Clevelandy, Christmas Ale bacon from The Pork Chop Shop. In addition to the cafe, there are a few prepared food kiosks throughout the market. I haven't tried all of them yet (I'm comin' for you, amazing-smelling falafel place), but one of my favorites is Crêpes de Luxe, which makes both sweet & savory crepes. Thrillist recently featured this photo of mine, enjoying a spinach-and-bacon crepe from the balcony of WSM. 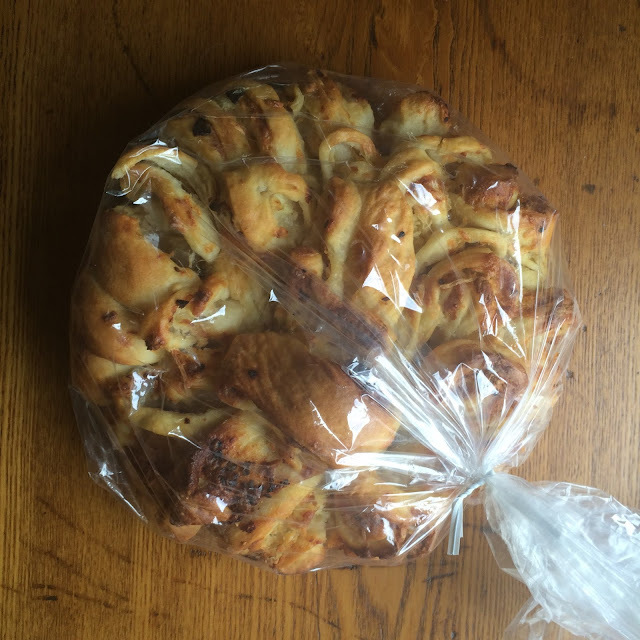 And now for the pièce de résistance of my love of West Side Market: vidalia onion & cheese bread from Vera's Bakery. They sell other varieties, too - an artichoke/feta bread, a bacon/cheddar bread, some garlic-filled version - but this is my personal favorite (& their bestseller). It's cheesy & oniony, crunchy on the outside & soft inside, & I have, uh, accidentally eaten an entire loaf in one sitting, of which I'm only mildly ashamed. This doesn't even begin to cover all the things I love from West Side Market. I also love the BBQ beef jerky from Sebastian's Meats, the carrot/lemon/pear juice from Juice Garden, the macarons from Michael's Bakery... the list goes on & on. 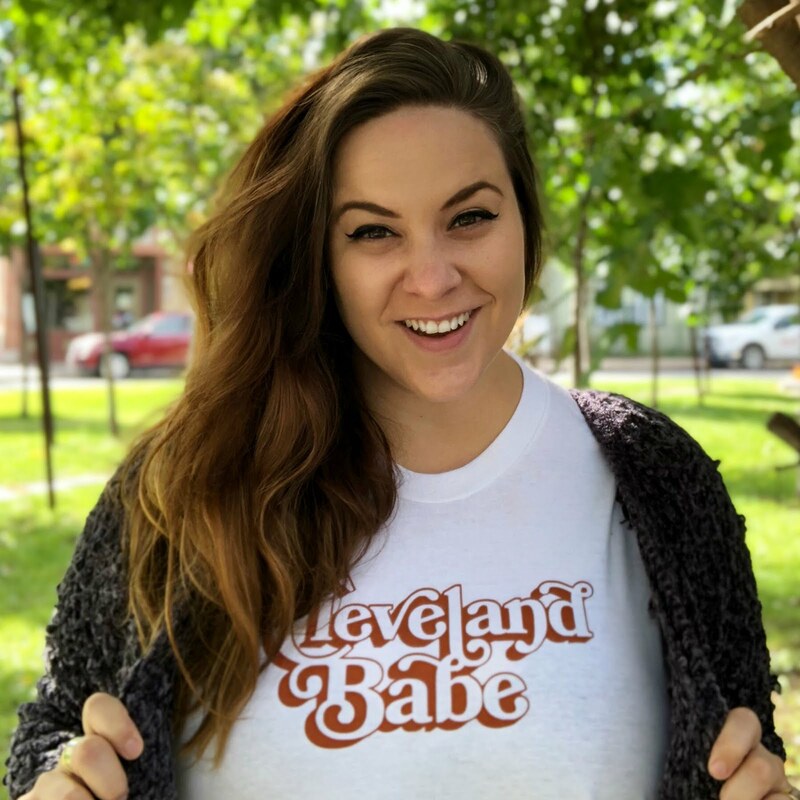 I also bought my favorite Cleveland shirt - the one I'm wearing in my blog profile photo! - from WSM, at the Fresh Brewed Tees kiosk. 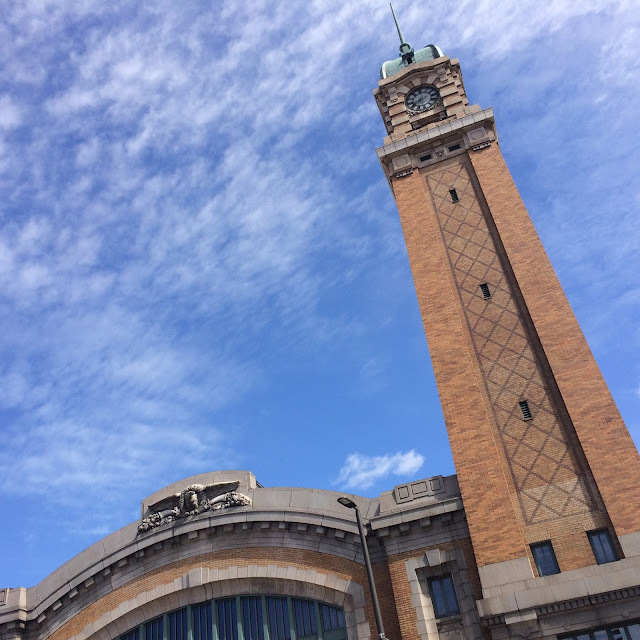 What I'm trying to say is this: On a sunny day, West Side Market is the absolute best place to be in all of Cleveland. And on all the other days - because God knows this city doesn't see as much sun as we'd like - it's a perfect place to stock up on goodies to take home & hunker down with until the next sunny day rolls around. 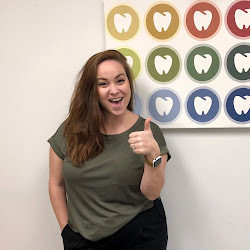 Check out my other Cleveland adventures, which so far include activities like attending an extravagant brunch, drinking with dinosaurs & exploring an historic cemetery - &, of course, stay tuned for more to come!